Appreciate Database Performance Monitoring Tools for Amazon Aurora by DataSunrise. Database performance assessment and analysis can be considerably facilitated with right information on database processes at hand. DataSunrise ensures clear visibility of Amazon Aurora operations. Examination and evaluation of data provided can allow to eliminate vulnerabilities related to DB performance. No one is secured from obstacles arising out every now and then during DBMS operation. DataSunrise Database Performance Monitoring Tools for Amazon Aurora provide information required to analyze your database performance, contribute to deep understanding of its processes, facilitate determining and eliminating vulnerabilities in the database engine. 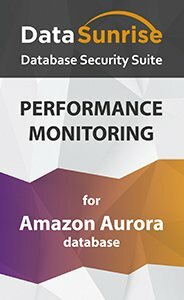 Logging of all queries to Amazon Aurora. Evaluate queries executed in transactions and identify weak points in separate operations. Redundant or unexpected queries can be easily stated. Logging of responses to all queries. It can be required to determine problems that appear during operation of an application. Data volume transmitted or received by a server. Time spent for query execution as well as dynamics of query change in time. Query types (INSERT/UPDATE/DELETE/SELECT) and their execution frequency as per these types. To summarize, with helpful insights into DBMS processes offered by DataSunrise Database Performance Monitoring Tools for Amazon Aurora you get an effective solution for DBMS performance and software error assessment.